OXFORD, Miss. – Federal authorities have produced scant evidence linking a Mississippi man to the mailing of ricin-laced letters to the president and a senator, his attorney says. Christi McCoy said after a court hearing Friday that the government has offered no evidence to prove her client, Paul Kevin Curtis, had possession of any ricin or the seed from which it is extracted — castor beans. 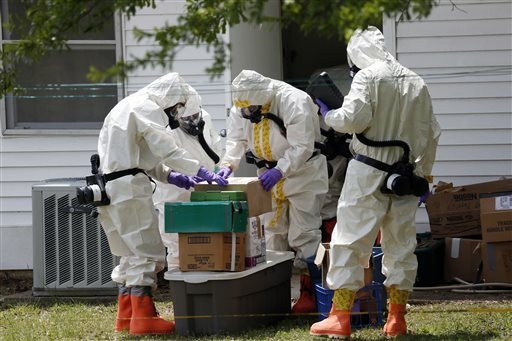 An FBI agent testified during the hearing that he could not say if investigators had found ricin at Curtis’ home, and McCoy said the evidence linking the 45-year-old to the crime so far has hinged on his writings posted online. Curtis is adamant that he did not do this, and McCoy said she has seen nothing to prove him wrong. Prosecutors had wanted to delay the hearing because searches of Curtis home and car had not been completed and DNA and other tests are pending. FBI spokeswoman Deborah Madden said Saturday that she couldn’t discuss what was found during the search of Curtis’ home because it’s part of an ongoing investigation. Curtis’ brother Jack Curtis and 20-year-old daughter Madison Curtis watched the court proceeding Friday and said afterward they are not convinced he did what he is accused of, even though they tried to keep an open mind about what would be presented. “After hearing what I heard in this courtroom, it appears to me that the reason I haven’t been provided any evidence is there appears to be none that would link my brother directly to the charges that have been made,” Jack Curtis said after the hearing. So far, Paul Kevin Curtis is the primary focus for investigators and the only person arrested in connection with sending those letters and a third threatening letter mailed to a judge. But during Friday’s hearing, FBI agent Brandon M. Grant testified that authorities were still trying to determine whether there were any co-conspirators. Grant said under questioning by Curtis’ attorney that he could not say whether any ricin had been found at Curtis’ home because the investigation was ongoing.